You could say we know shoulders at Cressey Sports Performance. Because we work with a ton of overhead athletes (and a lot of meatheads who have the uncanny ability to extend “bench day” to 4x per week), we’ve taken it upon ourselves to learn everything there is to know about the shoulder. Give or take. Everything from assessment and corrective exercise strategies to program design and effective ways to soften the blow when you tell someone with limited shoulder flexion that performing barbell snatches probably isn’t a good fit for them (“Dude, you can’t lift your arms above your head!”)…it’s all in a days work at CSP. To the untrained eye that looks like a normal, beefy back.1 Those “x’s” you see aren’t some weird, hipster, tribal tattoo whateverthef***. Nor do they reflect some kind of pentagon fetish. They’re actually marks used to highlight “landmarks” of the scapulae. The outer x’s mark both the superior and inferior border of the medial border of the scapulae. 1. Scissor hand didn’t chop off this person’s head. 2. The right shoulder is lower (which plays into some of the “predictive” patterns you’ll find under the Postural Restoration Institute philosophy). 3. On BOTH sides you’ll note the inferior border is INSIDE the superior border, speaking to more of a downwardly rotated scapulae. 4. You’ll also note more of a “depressed” presentation of the entire shoulder girdle/complex (notice the sloped shoulders?). An easy way to ascertain this information is to compare where the AC joint lies in relation to the SC (sternoclavicular) joint. In a “normal” presentation, the AC joint is (typically) 1-1.5 inches above the SC joint. In this example it’s even (see pic below). Don’t worry: that loser is me. 1. I can spell scapulae correctly. 2. 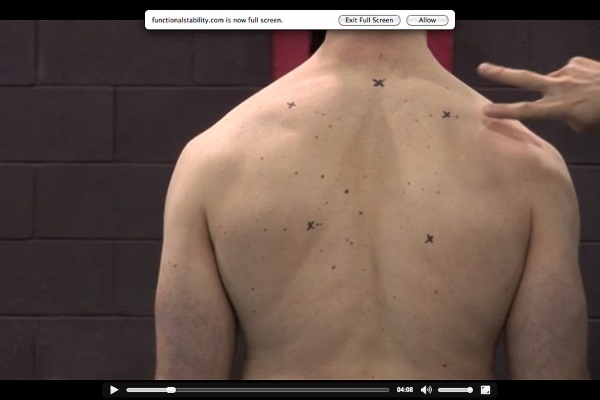 Shoulder assessment sometimes takes a keener eye for detail. 3. It served as a nice segue to today’s Exercises You Should Be Doing. Lack of scapular upward rotation (and subsequently poor eccentric control of downward rotation), poor external rotation strength, lat dominance, poor shoulder flexion, classic Upper Cross Syndrome (shortened muscles anteriorly, lengthened/weak muscles posteriorly), poor tissue quality, alignment issues, and gluten intolerance…because, why not? Gluten is blamed for everything else nowadays. The two exercises below are two that I “stole” from physical therapist Sue Falsone, and are ones that provide a lot of bang-for-our-corrective-training-buck with regards to improving shoulder function, performance, and health. What Does It Do: Helps strengthen/activate posterior cuff, helps with driving more scapular posterior tilt, strengthens glenohumeral external rotation, and provides a nice stretch to the anterior musculature (pecs, namely) which are often short/stiff. Key Coaching Cues: It’s important to OWN RIB POSITION <– something I discuss HERE). What you don’t want to happen is to drive through lumbar hyperextension and allow the ribcage to flair out too a large degree. This creates a poor zone of apposition, which then starts a cascade effect where we start talking about the Posterior Mediastinum and how over-extension will “inhibit” our nervous system and affect diaphragmatic function. It’s a deep, dark, rabbit hole that I don’t want to get into here. Just don’t do it…mmmm kay? Chin stays tucked. Wrist must stay neutral throughout. Pretend like you’re making the number “11” with your arms. Also, be sure to protract away from the wall which will help activate the serratus anterior. You want to drive movement through the elbows. If you drive through the wrists they won’t stay neutral, and you fail at life. There won’t be a ton of ROM here, so don’t judge this exercise by how much distance you achieve. The bread and butter of this exercise (to me at least) is protracting away from the wall, attaining the posterior tilt of the scapulae, and then CONTROLLING the return back. What Does It Do: I consider this a progression from the Windshield Wiper, albeit in this context we’re trying to drive more scapular upward rotation and learning to control, eccentrically, downward rotation. Key Coaching Cues: Much the same as above. Watch for lumber hyperextension and owning rib position. Start with your arms emulating the number “11,” protract away from the wall, provide a bit of external rotation to the band, and then “walk” your arms up gradually. I like to tell people to stop when their elbows reach eye-level. From there work your way back to the starting position by CONTROLLING the movement; don’t just allow your arms to fall back down into position. With both exercises I’m more inclined to do these as part of an extended warm-up, as their own corrective approach, or as a “filler” in between sets of squats or deadlifts. Wall Walks: sets of 3-5 “walks” (up and down). Give them a try today and let me know what you think.